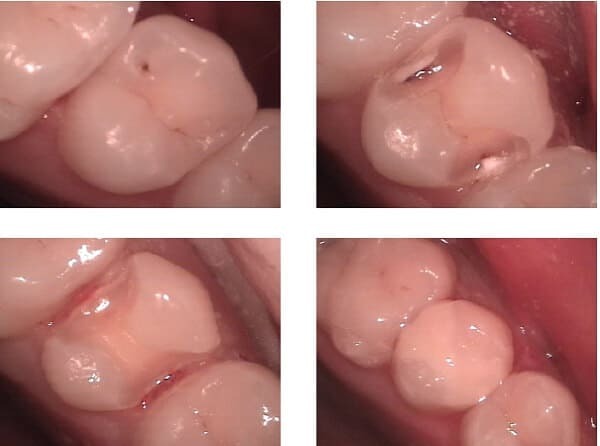 A white (composite resin) filling being placed. By Jeffrey Dorfman [CC BY-SA 3.0]. Losing a filling can be stressful, particularly when unexpected. People have often lost a filling while chewing or eating which can be surprising and even startling. It’s important not to worry too much when you have lost a filling, as most likely your dentist will be able to repair your tooth and replace the lost filling. The first thing you should do when you have lost a filling is to find all the broken filling pieces and get them out of your mouth. These pieces of filling or tooth can be hazardous if you swallow or breathe them in! Don’t try to stick them back if it falls out – because it will never stick well. If you do swallow the filling or tooth, this is not necessarily a concern as the pieces generally pass without any further issues. If you do breathe the filling into your lungs, seek medical attention immediately. The second thing you should do when you have lost a filling – is to call your dentist and book an appointment as soon as possible to to replace the filling. The sooner a protective filling is back in place the better. If the filling was placed recently, make sure to let your dentist know, and return to your regular dentist so they can fix any problems. If a filling repeatedly gets lost, let your dentist know it is a repeat offender and ask why. The third important step if a filling has fallen out to take is to keep the area absolutely clean until you can see your dentist. When you have lost a filling, tooth destroying bacteria and gum inflaming germs take advantage of holes and spaces where fillings used to be. Be sure to brush gently and floss gently around the missing filling. If you use a mouth rinse that can really help keep the area clean. You could even make a salt water mouth rinse to help avoid inflammation and keep the area clean. If your tooth is hurting or sensitive after your filling has fallen out, there are a few steps you can take to help with the pain. Sometimes dentists recommend over the counter painkillers to help with dental pain. It is best to talk to your dentist when you book your appointment and ask their advice if heading down this path. You could pack the area with tax or commercially available temporary filling materials to stop hot and cold from making the tooth sensitive. Avoid hot, cold, and extremely sweet foods until you get the sensitive tooth fixed – these are common triggers that can cause pain. If you have lost a filling, the best first step is to call your dentist. After the filling has fallen out avoid hurting the tooth more by chewing on it until you see your dentist. Some people take painkillers if they are healthy enough to do so, check with your dentist when you make the appointment. Consider pharmacy temporary fillings if the tooth is sensitive and there is delay until your appointment. Why Dentists Ask Questions When They Have Instruments In Your Mouth? The First Dentist Visit: How Old Should My Child Be? If my molar tooth is not sore it it ok to leave until sore after lost metal filling and some tooth? A broken filling could trap food, break more, or become infected. I’d suggest making an appointment with your dentist and getting their opinion. Get it fixed before it becomes a bigger problem!